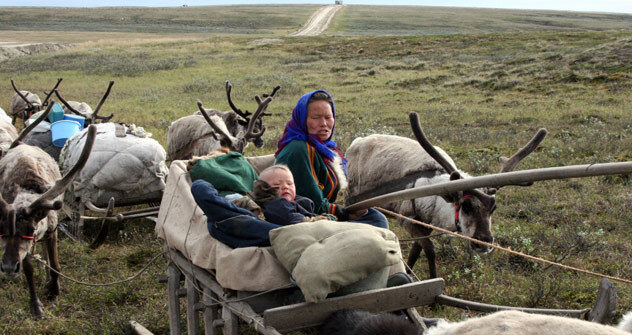 Russia’s nomadic reindeer herders now coexist with roads, rail, pipes and drilling towers. Lena Sarteto’s puffy, rough-skinned hands are a flurry of activity. As water boils over the fire in the center of her teepee, Sarteto, a nomad with the Nenets indigenous people of western Siberia, is cooking a feast for her guests and her family of five. She chops up dark red pieces of jerked deer meat, peels a huge silver fish and places pieces of dry bread and cookies on plates that she stores in a wooden sled. Her floor is the grass beneath her feet; fish bones and scales litter the room around the fire. The fish bones will stay there when they move on. Sarteto is in a hurry. In a few hours, her small nomadic group of about 10 families — still called Brigade No. 5, their official name from Soviet times - will push further n orth. It is early Polar summer, and taking advantage of the almost continuous light, they herd their 3,000 reindeer to the shores of the Kara Sea, reaching that part of the Arctic Circle in August. And then they turn around, fleeing the biting frost and returning their reindeer to grass and moss of the warmer tundra. It is an age-old cycle, but one that these families know is increasingly under threat. The Yamal Peninsula is also home to Gazprom, the huge Russian energy company that supplies natural gas to much of Western Europe. And as Gazprom pushes into the peninsula, it has brought the kind of development — road, rail and pipelines — that is transforming the tundra. The Nenets have been introduced to asphalt highways, rusty metal, wire and drilling towers. Russia’s wealth appears to be cut out of the tundra they once called their own. The Yamal Peninsula contains the Bavanenkovo gas field, a vast tract containing about 4.9 trillion cubic meters of natural gas that Gazprom expects to begin pumping next year. Drilling towers have begun to dot the horizon. And to help exploit the gas resource, a new 325-mile long railroad opened last year. The state is making plans to move 165 reindeer families out of the tundra and into village and towns. Many of the 13,000 nomads left on Yamal Peninsula fear they will be forced into permanent settlements — a lifestyle change the government is encouraging, but which is dreaded by a people who have long forged their identity as travelers across the tundra’s expanse. No one knows exactly how many hundreds of years the Nenets have kept the same yearly rhythm herding the reindeer one step ahead of the biting frost. “Our research shows that the biggest fear nomads have is not global climate change, but the fear of being pushed out of the tundra,” said Vladimir Tchouprov, a spokesman for Greenpeace Russia. During a recent camp break, men exercised by lassoing deer while women put up the teepees, or mya, as the Nenets call their homes. The reindeer provide the skins for the teepees, fabric for clothes and food. Energy extraction and development is not the first assault on their way of life. The Soviet Union attempted to force the Nenets into a form of collective farming. They split various Nenets tribes into “kolkhoz” brigades, and obliged them to pay reindeer meat as taxes. Thousands moved into towns in Siberia, and the indigenous people struggled to maintain their traditions. Today, Nenet activists see government efforts encouraging them to move into towns as a renewed assault. As Lena Sarteto’s Brigade No. 5 moved north, they had to cross two paved highways, a struggle for the reindeer — 300 per family - and young families with nearly 100 wooden sleds. A team of Gazprom workers had covered the tarmac with a slippery insulation material, a goodwill gesture to ease the migration route to pasture. Traditionally, different Nenets groups moved across the Yamal Peninsula along defined corridors. But Sarteto’s normal route leads into the heart of the gas field. A frustrated spokesman for Gazprom said the company is attempting to share the land with the tribes and act as a benevolent neighbor, but gets little thanks. “No matter how hard we try to help them - provide them with transportation, pay them salaries for what they historically did for free, build bridges over the pipes, or build schools and kindergartens for their children, Nenets still complain,” said Andrei Teplyakov, a spokesman for Gazprom’s Yamal operation. Indeed, there is a long list of Gazprom efforts that could be read as improvements for the nomads in what is called the Yamalo-Nenets Autonomous Area. The company pays salaries directly to the Nenets tribesmen for herding or to Nenets women for their caregiving. Lena and her husband, for instance, receive about $2,500 a month, a very decent income in this part of Russia. Every summer, Gazprom helicopters fly to the nomads’ camps to pick up over 2,000 Nenets children and take them to boarding schools in Yar-sale, the tundra people’s capital. Anna Nemtsova is a Moscow correspondent for Newsweek.